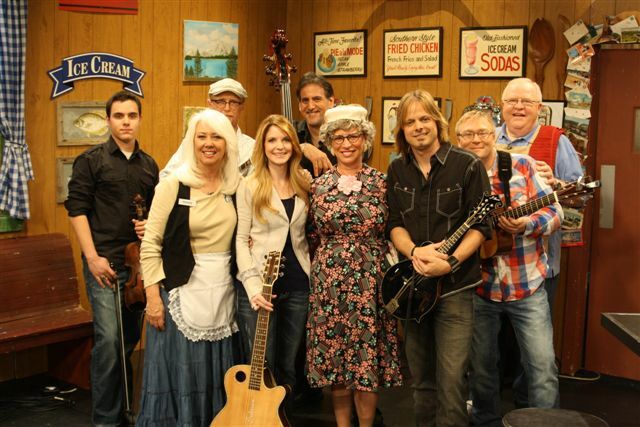 Check Larry's Country Diner and local listings for specific channel information. The Roys and their band (Kaufmann-Banjo, D'Angelo-Upright Bass, White- Fiddle, Jeremy-Acoustic Guitar) performed selections from their newly-released Rural Rhythm Records' CD, LONESOME WHISTLE, including the title track; Trailblazer; Nothin' I Can Do About It Now, and their current single, Coal Minin' Man. "We've been fans of Larry's show for a while and we're really happy to be on it," says Elaine. "The cast is just so much fun and the food is great," adds Lee. The Roys move into high gear for next month's CMA Music Fest 2011 (June 9 -12). The duo and their band has a busy performance schedule during the Festival (Midnite Jamboree, WSM/Durango Stage, Hard Rock Stage, Bud Light Stage, Nashville Convention & Visitors Bureau Stage, Power Source Showcase at B.B. King's), and will sign autographs in the GAC- TV, FARM BOY/FARM GIRL, Roughstock and WSM Radio booths as well. Lee and Elaine were recently featured on several Fox Television Network shows, plus Better TV, ABC-TV's What's The Buzz, Daytime, GAC-TV, and Daily Buzz. Their music can be heard worldwide over the airwaves, including on Sirius XM, 650 AM WSM Radio, and this coming weekend on the nationally-syndicated radio show, Country HitMakers. Fans can receive the latest updates on The Roys and all their favorite Bluegrass artists now on their mobile devices simply by texting "bluegrass" to 90210. For audio clips, contests, the "Coal Minin' Man" video and more log on to www.theroysonline.com.